Rob Roy was an 18th century folk hero and rogue, sometimes known as the Scottish Robin Hood. He was reputed to have been involved in cattle stealing and blackmail, which were old and at that time still honourable highland practices! 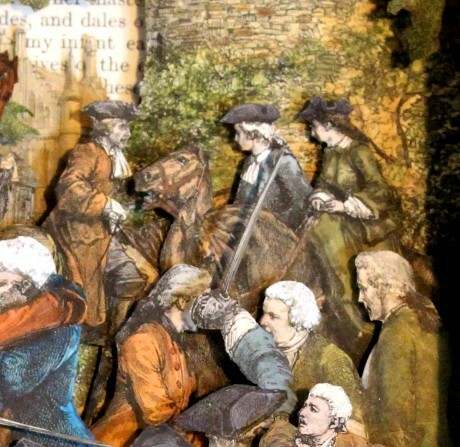 Gentlemen of the day wore wonderful romantic fashions, with their brightly coloured coat, waistcoat and breeches costumes, long wigs and tricorn hats – all very much at odds with the violence of the Jacobite uprisings. 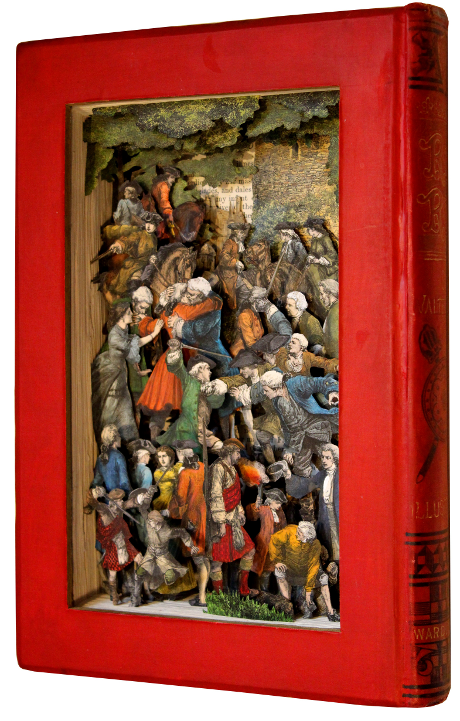 The illustrations in the book (circa 1890) were many and detailed, but all in black and white, so I hand-coloured them to give the piece added depth and energy.The front cover of this book is so exceptionally beautiful, with its lovely red, black and gold detail, that I wanted to preserve it and therefore have hollowed it out through the back.